Buzard Pipe Organ Builders completed a renovation project in the spring of 2012, that included: restoration of the wind system, repairs to pipework, rebuilding of the concsole, and installation of a new solid state relay and combination action. 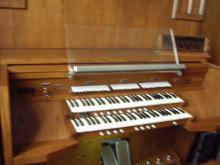 The first organ in the church of which we have any record was built in 1912 by the Hinners Organ Company of Pekin. It was a two manual and pedal, mechanical action instrument of 14 registers. Evidently, this instrument was relocated to the present building at the time of its construction. The Hinners was replaced by the present instrument in 1975. It is a two manual and pedal, electromechanical action instrument with 16 ranks and 924 pipes, built by the Wicks Organ Company of Highland, as their Opus 5523. The consultant for the project was Dr. Thomas Gieschen, then professor at Concordia University, River Forest, IL.